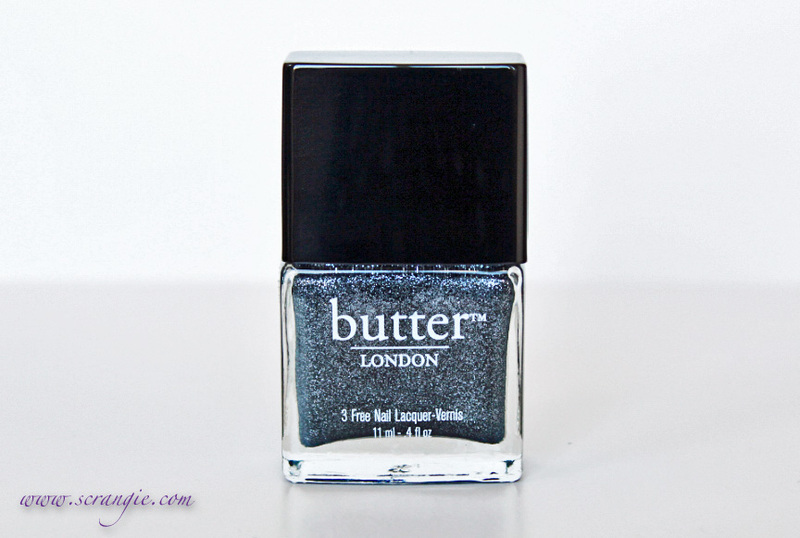 Butter London Gobsmacked. 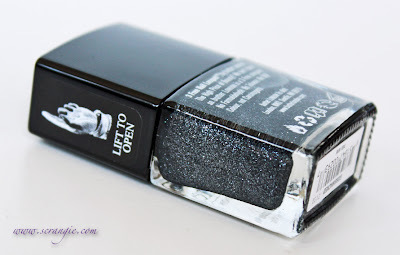 A semi-sheer charcoal base with small dark grey-silver glitter. The glitter in this is very small, almost a microglitter. It's fine and fairly smooth. The color has an overall blue tone to it. Reminds me of Milani Silver Dazzle. 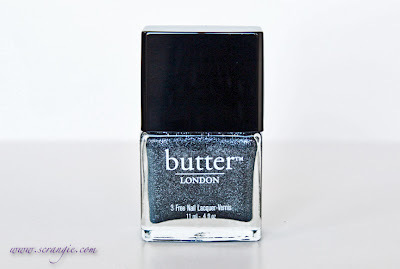 Butter London Gobsmacked, no topcoat. Butter London describes it as having a textured finish, so I thought I'd see how it looked fully dried without topcoat. It does look textured, but it doesn't have that sparkly, sandy, sugar-like matte textured finish that the China Glaze On Safari glitters have. I much prefer it with topcoat, it's not matte enough and it doesn't sparkle without topcoat. The formula on this was good. Thick but smooth since the glitter is so fine. It's nicely opaque and I didn't have any problems with the glitter clumping. I used three coats plus one coat of topcoat here. It does eat topcoat as it dries, so I added a second coat of topcoat the next day to keep it smooth. I like it a lot, but it's not amazing or legendary like I was expecting. It's a nice glitter in a cool color with a good formula and I'm loving it as a pedicure color right now. I bought mine online from Ulta, $14. It's so pretty! I like it a lot, your nails look amazing! I got this one about 2 weeks ago and while I do like it very much, I am a little disappointed. I read a few blurbs about it before hand that pretty much said..."Gobsmacked is unlike anything we've ever seen before !!!" So I had this build up in my twisted little lacquer addicted mind that this was a must have. So of course when I saw it at Ulta I immediately pounced. Now having seen Cirque Dark Horse, I kind of wished that I had waitied a bit. I do like the idea of ricking Gobsmacked as a pedi. My tootsies need a change so I think I'll try that this weekend. Thanks so much Scrangie - I am constantly in awe of your blog, it's become one of my favorites. I love this. It's like a granite worktop! It reminds me of Tinsel Town but a whole lot easier to remove!! I can't wait to get my Dark Horse! Should be receiving it today!! It reminds me of Tinsel Town, but a whole lot easier to remove! I ordered my Dark Horse! Should get it today! I think this is pretty, but Dark Horse looks even better! It really is pretty in and of itself, but you killed it with your Dark Horse post. Still not a bad polish, though, very pretty in the way it was intended to be! Agreed. Very pretty, but not a Big Wow when stacked up against Cirque's DH. Thanks for the show, Scrangie! Haha! Nah, you just pull to remove the big, awkward overcap so you can use a normal handle. The square cap used to not come off (or at least *I* couldn't get it to come off), that's one of the things they've improved since I first tried them. Aha! I wonder if Illa bottles do that - I can't apply Phallic without utterly mangling the job. In my experience, most of them do. The newer Illamasquas definitely do, but I can't remember if the old ones come off or not. Wow this really is gorgeous! But I know what you mean. It's hard to be impressed after seeing how majestic Dark Horse is! Haha sorry I felt like I wanted to use the word majestic XD. Gorgeous! But after seeing Dark Horse, I think I'll be picking that one up and passing on this! This is so gorgeous! I really love it! Yes it most certainly needs a clear shining top coat. You've changed my Illamasqua life too :) I like this but the BM range is a bit expensive for what you get IMO, I agree on the Cirque. Great swatches though! It has a smokiness to it. I like it.